Searching for a job isn’t easy. Besides an attention-grabbing resume, you need relevant experience and skills. Knowing people who can put you in touch with companies looking to hire helps too. In other words, being a natural with networking could help you land your next job. Is Networking Necessary for a Job Search? Connecting with people outside your usual circle of friends helps create meaningful relationships. That’s especially true when you’re on the hunt for a new job—or perhaps another career. Your resume doesn’t tell the whole story. Plus, a text resume doesn’t let your soft skill shine through. A 2016 survey asked thousands of people how they got their most recent jobs. Networking was the most successful method for over three-quarters of them. As much as 50 percent of positions get filled due to referrals from current employees. Networking could be the missing piece in your quest to find a job you love. Fortunately, the following apps can turn you into a networking pro by putting you in touch with prospects, thus helping you land your next job. Some of the people most valuable to your job search might only live a few miles away. This app lets you find them by tweaking various search parameters to meet your preferences. Specify industry and job title as a start. Then, you can add other preferences such as an age range, gender, or nonwork-related interests. A proximity filter shows people closest to you. A social networking component lets you directly message people through the app. That aspect facilitates setting up meetings. 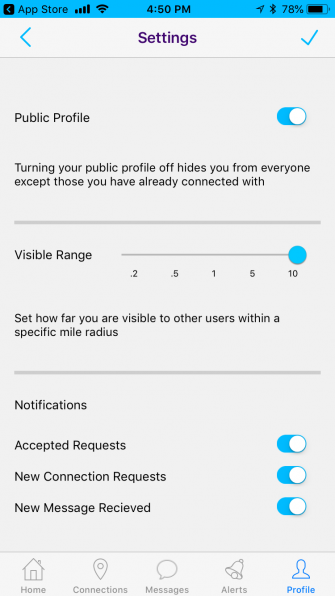 It’s also possible to choose whether to make your profile public or only visible to app connections.